More than 80 foreign delegations will take part in the Army-2016 international military forum to be held near Moscow next week, Russian Defense Minister Sergei Shoigu said Friday. MOSCOW The Russian Defense Ministry’s Army-2016 forum is set to take place on September 6-11 in Kubinka, a western suburb of Moscow. The forum is expected to be the country’s largest event designed to showcase modern weapons and military equipment. “It will bring together over 1,000 Russian enterprises and organizations, more than 80 foreign delegations. National expositions by our colleagues from the CSTO [Collective Security Treaty Organization]- Belarus, Kazakhstan and Armenia — will be presented at the exhibition,” the minister said during a conference call at the Russian Defense Ministry. The Army-2015 forum attracted over 800 exhibitors and over 200,000 visitors from 73 countries, as well official delegations from 38 countries. While the Turkish Army is known as the second largest force in NATO, Russian political analyst Evgeni Krutikov suggests that it resembles nothing so much as a “paper tiger.” The analyst notes that in the wake of the attempted military coup the country’s army could be considerably weakened. Although Turkey’s army is the second largest force in NATO with its 750,000-strong military contingent, it is not as powerful as it seems, Russian journalist and political analyst Evgeni Krutikov notes. “The attempted coup [in Turkey], the war in Syria, the Karabakh turmoil and the Russian Su-24 tragedy have attracted a lot of interest to the Turkish army. This army is looking very impressive, but only at first sight: it has had more problems and failure than success,” Krutikov writes in his article for online newspaper Vzglyad. The political analyst has called attention to the fact that the Turkish army was formed “chaotically,” depending much on economic and political conditions.Krutikov underscores that for a long period of time Ankara has regarded Greece as Turkey’s major rival, regardless of the fact that both Turkey and Greece are NATO member states. Given this, it is hardly surprising that a major part of Turkey’s military force is concentrated on the country’s western border. Whatever happens in Syria and Turkey’s Kurdish regions, the traditional balance of forces remains intact, according to the journalist. Taking a walk down the memory lane, Krutikov insists that during the Cold War the Turkish army had not boasted any major military success except its invasion of the island country of Cyprus in 1974. Still, the Turkish army defeated the Cyrpriots mostly because of numerical superiority, according to the journalist. In general, there were a lot of flaws in Turkey’s military operation: for instance, a maritime battle near Paphos where the Turkish air force attacked its own navy. Interestingly enough, the Turkish Army underwent significant changes in the 1990s under Tansu Ciller, Turkey’s first and only prime minister to date. Ciller re-equipped and transformed the Turkish Army into a modern fighting force capable of dealing with domestic challenges, including those posed by the PKK (Kurdistan Workers’ Party). It is worth mentioning that it was Ciller who persuaded Washington to designate the PKK as a foreign terrorist organization.At the same time, Tansu Ciller turned a blind eye to the emergence of radical nationalist parties in Turkey, most notably Grey Wolves, and had no scruples about using them as a tool in Turkey’s confrontation with the Kurds and Armenians. Despite the modernization initiated by Ciller there were still gaps in the Turkish Army’s defense capabilities in the early 2000s. However, although then Prime Minister Recep Tayyip Erdogan pledged to strengthen the nation’s armed forces and equip the army with modern weapons, his vows often turned out to be a hot air. While the Turkish army comprises more than 700,000 personnel, about 470,000 of its members are not career soldiers, Taraf explained, as quoted by Al-Monitor. 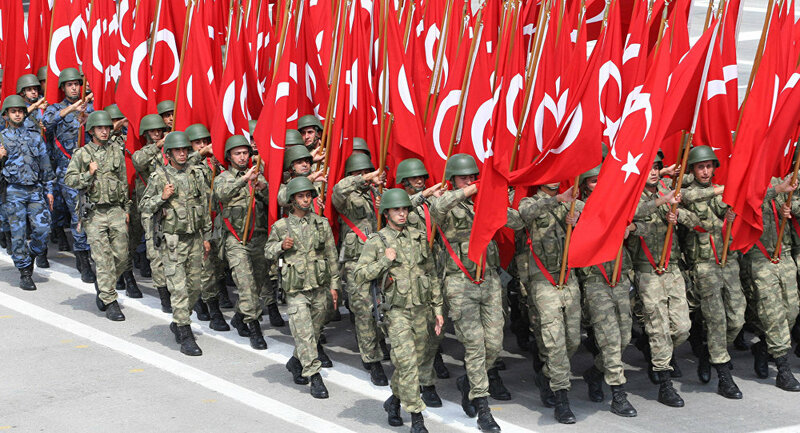 The media outlet revealed that Turkey spends “most of its budget on personnel expenses” of about 40,000 officers, 100,000 non-commissioned officers, 65,000 gendarme/army specialist soldiers, 8,000 reserve officers and 470,000 soldiers doing their compulsory military service. Furthermore, the army also employs 50,000 civilian workers, it stated. As a result, “the army is trying to make up for its technology deficit with unlimited manpower,” the media outlet noted, adding that “basing Turkey’s defense concept on the human element instead of technology creates weaknesses in intelligence, reconnaissance and surveillance.”Echoing Taraf, Krutikov highlights that the Turkish navy, air and ground forces need serious modernization. Most of the weapons obtained from NATO are obsolete and can be used only in limited local conflicts. In addition, the country’s air defense is dependent on NATO and the US’ military installations in Turkey. Moreover, there are also problems in coordination between the country’s uniformed services. Meanwhile, the failed military coup in Turkey is likely to add insult to injury with thousands of career military servicemen detained. On Monday Turkish Prime Minister Binali Yildirim announced of restructuring within the Armed Forces in the wake of the attempted coup. “First of all, there is a serious need for restructuring in [public] institutions, especially the [Turkish] Armed Forces [TSK]. There is a security gap, as we have seen during the coup attempt. There are problems in [the] hierarchy between lower level and senior level [officials.] We will restructure [the army] in a manner that will resolve these problems,” Yildirim said, as cited by Hurriyet Daily News. “Structures which produce revolutions should no longer have a place within the [Turkish] Armed Forces. We need to stop it from becoming a threat… There will be such changes that they will not even dare to make an attempt,” the Prime Minister stressed. It seems that the Turkish Army could be considerably weakened due to the ongoing purge and new changes announced Yildirim. In accordance to the plan of the international cooperation of the Russian Defence Ministry, Commander-in-Chief of the Russian Land Forces Colonel General Oleg Salyukov is paying working visit to Argentina. In course of the working trip, Colonel General Oleg Salyukov will have a meeting with the Minister of Defence of Argentina Julio Cesar Martinez. The European Union seems to be interested in creating a unified NATO-style armed force to protect itself from both internal and external challenges now that Britain, a fierce opponent of the initiative, voted for withdrawal from the bloc. Earlier this week, Brussels unveiled its Global Strategy, meant to update the EU’s foreign and security policy. In particular, the document calls to bolster defense cooperation in Europe. The new strategy has prompted some to say that Brussels is seriously considering establishing a European army. “The new Global Strategy paves the way for more far-reaching defense cooperation,” that could involve “creating a genuine European army,” according to the Danish daily newspaper Politiken.Brexit may be the driving factor in these plans. Britain has the strongest military in the EU so European leaders fear that after London leaves the EU’s military capabilities will decrease. At the same time, London has long opposed creating a European army parallel to NATO. After the Brexit vote, an “obstacle that prevented better cooperation has been removed,” Marcin Zaborowski, Executive Vice President of the Center for European Policy Analysis (CEPA), told Wirtualna Polska news site. Nevertheless, if created a European army would be a significant addition to the military and defense burden of EU taxpayers. Here is a list of the security organizations Europe is already paying for. The UN Police has been an inherent part of the UN-led peace operations. Currently there are nearly 15,000 UN Police operating in over 90 countries. Since the 1960s, the UN has been deploying its police forces in different peace operations. Now, the UN Police acts a corrective power with domestic police and other law enforcement agencies.The UN Police acts at a mandate of the UN, thus by agreement of a certain UN member state. The UN does not have its own police and military forces, and member states contribute their forces to the UN Police. It can operate in any UN member state. Police officers of any member state can be deployed to the UN Police. Currently, Frontex, a European border security agency, is undergoing major reforms. Previously it relied on coast guards provided by the EU members but now it will have a permanent corps of border guards. It will be deployed to help countries which have difficulties securing their borders. The corps will operate across the EU and will be able to act even without authorization of a certain country in the event of a serious crisis. The International Criminal Police Organization is an intergovernmental organization facilitating cooperation between national police forces. It involved the police forces of 190 countries. Interpol coordinated national police forces, including in fighting cybercrimes, terrorism, and organized crime. Interpol does not have own forces. Police officers of any country members can be sent to the organization. The European Police Office is the law enforcement agency of the European Union. It handles criminal intelligence and combats serious organized crime by coordinating actions of the relevant authorities of the member states. Europol also does not have own forces. Personnel of national law enforcement agencies are seconded to work in the organization. The UN peacekeeping forces comprise civil and military personnel seconded by UN country members. But Blue Berets usually refers to military forces. Currently, nearly 120,000 personnel from 114 countries, including 18,000 civil personnel, are involved in 16 UN peacekeeping missions around the world. The Blue Helmets are deployed at a mandate from the UN, thus by agreement of the certain country. Originally established as a defense military alliance of the United States and Western Europe, NATO has been conducting military operations with and without UN authorization. NATO does not have its own forces. Its capabilities depend on contribution of the member states. EUFOR is the closest to a European army. In fact, it is a staff coordinating forces seconded by its main country members, including France, Germany, Belgium, Spain, Luxembourg, and Poland. The decision to deploy forces is made by the five main country members. The decision may be independent or at the request from the EU, UN, NATO, and OSCE. EUFOR does not have its own forces. Its personnel can be deployed around the world. DUSHANBE, February 3. /TASS/. Another thousand junior specialists of the Tajik army will undergo training at Russia’s 201st military base in Tajikistan, Russian Deputy Defense Minister Anatoly Antonov said on Wednesday. ‘In 2016, we’ll train another 1,000 junior specialists for the armed forces of Tajikistan at the 201st Russian military base, for which the required resources are stipulated,” Antonov said. It was earlier reported that the Russian military had trained over a 1,000 specialists for the Tajik army. In particular, Russia trained commanders and gunners of Grad multiple rocket launch systems, as well as gunners and operators of T-72 tanks and BMP-2 infantry fighting vehicles. According to the deputy defense minister, about 560 Tajik servicemen are currently studying at Russian Defense Ministry institutes for free. “We are planning to provide military support for Tajikistan in future and coordinate our actions to ensure peace and security in Central Asia,” Antonov said. The Russian deputy defense minister said earlier that Russia would provide maximum assistance to Tajikistan with military hardware and equipment deliveries. Antonov also noted the role of the 201st military base, which is a major outpost beyond the Russian borders. According to the deputy defense minister, “the welfare of the entire Tajik people and the Russian Federation depends” on the capabilities of the 201st military base. One of Russia’s Eastern Military District’s combined arms units will participate in joint military exercises in Vietnam. Russia and Vietnam will hold the first joint military exercises in the Vietnamese territory in 2016, the head of Russia’s Eastern Military District press service said on Thursday. “It is planned to use one of the district’s combined arms units stationed in the Amur Region,” Col. Alexander Gordeev told reporters. The Eastern Military District is one of the four operational strategic commands of the Russian Armed Forces. The district was formed by a Presidential Decree and signed September 2010.Russia is currently undergoing a $325-billion rearmament program to achieve a 70-percent modernization of its military by 2020. Russian Defense Ministry’s delegation will come to in China on Wednesday for a four-day visit. Officers of the Russian Defense Ministry’s Central Military District will arrive in China on Wednesday for a four-day visit, a district spokesman said. “The delegation includes mid-level and junior commanders, who will get acquainted with combat training and daily activities of the People’s Liberation Army of China,” Col. Yaroslav Roshhupkin said. The visit is being made at the invitation of China and will last until Saturday.